Industrial LCD manufacturer KOE has announced the introduction of a new 4.2-inch Rugged+ TFT display. The TX11D201VM0BAA features the latest generation of IPS (in-plane switching) technology, WQVGA (480 x 272 pixels) resolution, a 16:9 wide aspect ratio and an extended operating temperature range. Designed and developed for human-machine interface applications, the latest IPS display technology delivers exceptional colour saturation and stability, high contrast and deep black levels with 170° wide viewing angles (vertical and horizontal). The 4.2-inch display features a contrast ratio of 1500:1 and a white LED backlight with a brightness specification of 750cd/m² and integrated PWM dimming control. These features combine to ensure that display images are bright, colourful, clear and concise. 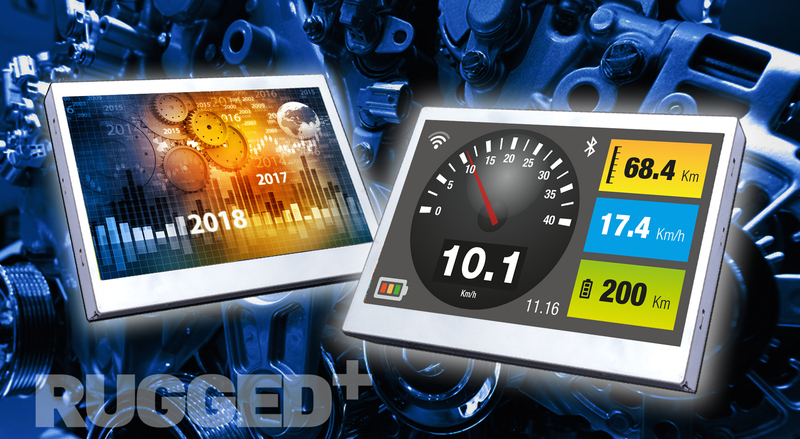 The ruggedised 4.2-in TFT display module is designed to function reliably under rigorous operating conditions found in some industrial process control, marine instrumentation, aerospace, in-vehicle displays and medical equipment yet still provide exceptional optical performance. Support for harsh environments is aided with an operating temperature range of -30°C to +85°C and a storage temperature range of -40°C to +90°C. The 4.2-inch display module has mechanical outline dimensions of 102.2mm (w) x 69.0mm (h) x 9.8mm (d) and an active LCD area of 92.88mm (w) x 52.632mm (h). The compact display module weighs just 97g. A 68-pin CMOS data interface supports 8-bit RGB and enables a colour palette of 16.7m colours.